Home Children's Swim Classes Why do we spin in circles in our baby, toddler swim classes? 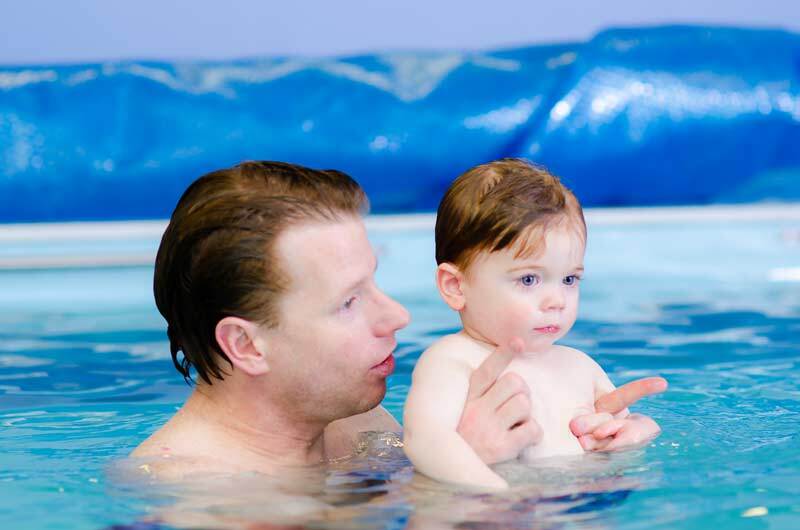 Why do we spin in circles in our baby, toddler swim classes? Question: In your baby and toddler swim classes, why do you have us spin around twice when we sing ‘She’ll Be Coming ‘Round the Mountain? '” Is there a purpose, or do you like to see how many parents follow instructions? You may be surprised to know that we have bona fide reasons for having you spin around with your little one. The spinning motion and spinning in two different directions is fun for babies and toddlers. It develops two important systems that help your child move in space: the vestibular and proprioceptive systems. The vestibular system helps your kiddo keep balance, coordinate movements of her head with her eyes, use both sides of her body at the same time (bilateral integration), feel the direction and speed of movement, and remain upright against the pull of gravity. The proprioceptive system helps inform your daughter’s her muscles and joints about how her body is positioned and moving. For example: Is she sitting upright? Are her legs underneath her? Are her arms stretched forward to the noodle? When should I sign up for adult swimming lessons if I want to be ready for summer vacation? Should I take group swim classes or private lessons? Enter your email address to be notified when we post a new blog article. Log into our online scheduling software. Copyright © Chicago Blue Dolphins. All rights reserved.